Mark Znidar comes to Press Pros Magazine after 33 ½ years at The Columbus Dispatch. 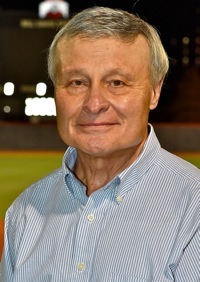 From 1996 until September 2018, he staffed high school sports, Ohio colleges that included the Mid-American Conference, Ohio State’s upcoming opponents in football and Ohio State baseball. In the previous three seasons he covered the Columbus Clippers triple-A baseball team. His other beats were Ohio State basketball (1985-88), Clippers (1985-86 and 1989-93), Cincinnati Bengals (1993-95) and NASCAR (1994-2008). He subbed on the Columbus Blue Jackets and Ohio State women’s basketball beats. In March 2017, Znidar was inducted into the Ohio Prep Sportswriters Association Hall of Fame. Znidar was born in Cleveland and raised in Richmond Heights. He graduated from Cleveland St. Joseph High School and the University of Dayton. He also worked for The Atlantic City Press, Lake County News-Herald and Baltimore News-American. He has a daughter, Amanda, son-in-law Josh and four grandchildren. So what if they only play once every fifty years? The Ohio State Buckeyes walked into the renovated Fifth Third Bank Arena and beat UC at its own game, on its own court. Columbus – What with Big Ten player of the year Keita Bates-Diop walking into the sunset to the NBA and heartbeat Jae’Sean Tate using up his eligibility, there were so many questions about Ohio State going into its season opener that it might as well have been called Team Unknown. And the Buckeyes couldn’t have stepped into a worse place to begin playing games that count than against Cincinnati at the grand reopening of Fifth Third Bank Arena. The building has undergone $87 million worth of renovations. At times, the noise from the capacity crowd had to give players the feeling they were at a heavy metal show. So many times, they had to think breathing on an opponent would result in a personal foul. But despite losing four key players off a conference runner-up, Ohio State sure looked like a bunch that has been through the wars in holding off the Bearcats 64-56 in a half-court game played in close quarters Wednesday night. Sophomore center Kaleb Wesson led Ohio State with 15 points, seven rebounds, two blocked shots and one steal. Senior point guard C.J. Jackson was next with 13 points. Junior forward Kyle Young totaled 10 points and eight rebounds and true freshman guard Luther Muhammad had 11 points on 4-for-10 shooting. The keys to this victory, though, was Cincinnati shooting 17-for-62 for 27.4 percent against combination helping man-to-man and zone defenses and the Buckeyes getting 14 second-chance points and 18 points in the paint. Holtmann expected play to be choppy because of the enormity of the game. The universities are separated by less than a two-hour drive, but have not played a regular season game in eons, quite simply, because Ohio State had refused to. Phoenix Bats proudly supports the Ohio State Buckeyes on Press Pros Magazine.com. Then there is the fact that Cincinnati coach Mick Cronin teaches his players to be relentless in protecting the rim and attacking it. The Buckeyes looked golden when Wesson dunked after taking a lob to make it 52-36 with 6:24 left to play. Credit Holtmann for a gutsy move in putting him back into the game with 12:34 left with three fouls after he sat all of 38 seconds. He didn’t pick up another foul. The advantage remained at 16 when Muhammad hit a three-pointer from the side 13 seconds later. But Cincinnati junior guard Jarron Cumberland of Wilmington kept hitting treys from NBA range. All 22 of his points came in the second half. His 10-footer in the lane cut the gap to 59-53 with 1:39 left. The Buckeyes began to nail down the game when Wesson rebounded a contested miss by point guard Justin Jenifer and was fouled. He made the back end of two free throws for a 60-53 lead with 1:11 left. Cumberland drilled another three-pointer with 59.6 seconds left, but Jackson dribbled time off the shot clock and drove for a pretty one-handed bank shot with 30.1 seconds left to make it 62-56. Jackson got the final points with two free throws with 10.2 seconds left. Well before that, though, Ohio State kept digging deep in coming up with big plays. 1.Cincinnati had run seven straight points and finally got its crowd into things when Young took down an offensive rebound and Wesson was fouled at the other end. He hit both free throws to make it 43-32 with 10:36 left. 2.A little more than one minute later, Young followed a miss by Wesson and gently put the ball off the backboard for a basket. He was fouled, made the free throw and it was a 14-point advantage. 3.With 6:53 left, Jackson knocked in a three-pointer at the shot clock buzzer to make it 50-36. Much of what Young accomplished didn’t show up on the stat sheet, and that was blocking out, getting a hand on loose balls for a teammate to recover and doubling down on defense. He had his trying moments as a true freshman last season, but the word from practices was that Young might be the most improved player on the roster. Ohio State had to be all smiles getting on the bus back to Columbus, but the coaching staff surely will get out the red marking pens in critiquing the game. There were only 13 turnovers, but too many were balls thrown right at the Bearcats. Muhammad, Andre Wesson and Keyshawn Woods had four fouls and Duane Washington Jr., Musa Jallow and Kaleb Wesson three. It was the third straight victory by the Buckeyes against UC this decade. They won 72-50 in the Wooden Tradition in 2006 in Indianapolis and 81-66 in a regional semifinal in NCAA tournament in 2012 in Boston. The teams are scheduled to meet in Columbus next season to complete the home-and-home contract.